Hyaluronic Acid – Why You Need It. Hyaluronic Acid may not have the sexiest name on the planet but it’s an incredible useful molecule when it comes to a youthful appearance. 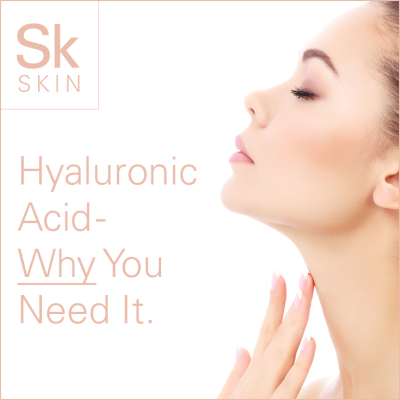 Although it sounds like something you would come across in a science lab, Hyaluronic Acid actually occurs naturally within your body and is a vital component for your skins strength and elasticity. It provides cushioning for your nerves and joints and plays a huge role in the health of the human eye. More than that, Hyaluronic Acid can help hydrate your skin and hair giving it a more radiant and perhaps youthful look! During younger years, your body has plenty of Hyaluronic Acid but as you age that amount declines significantly. In fact, by the time you reach the mid-40’s it’s likely that the levels in your body will be around half of what they were in your youth! This lack of Hyaluronic Acid may be the cause of some of the problems that arise with aging such as sagging skin, aching joints and dull hair. Hyaluronic Acid has quickly become a staple in the beauty industry and is widely available in capsules, skin creams and even injectables. The good news is you can actually improve your levels of Hyaluronic Acid, naturally. Organ meats. Foods that have high retinol levels – which is a component of vitamin A will also have high amounts of Hyaluronic Acid. So up your intake of livers, hearts and kidneys from a variety of animal sources. Vegetables. Starchy vegetables such as sweet potatoes can pack a Hyaluronic-punch. Sweet potatoes are a great source of magnesium, which is vital for the synthesis of any Hyaluronic Acid that you take in. Spinach and Kale are also great for supporting production of Hyaluronic Acid. Fruits. For those with a sweet tooth, there is one particular fruit that contains high amounts of Hyaluronic Acid and tastes pretty good, too; this amazing power source is the banana. Bananas are rich in magnesium and have a high fibre content; making them the ultimate snack. Add them to your morning smoothie or have one pre-workout to give you an energy boost. So there you have it, the importance of Hyaluronic Acid in one article. Now you know what it is, what it does and how you can improve your levels – make some changes to your diet and see if your appearance and health makes some improvements.